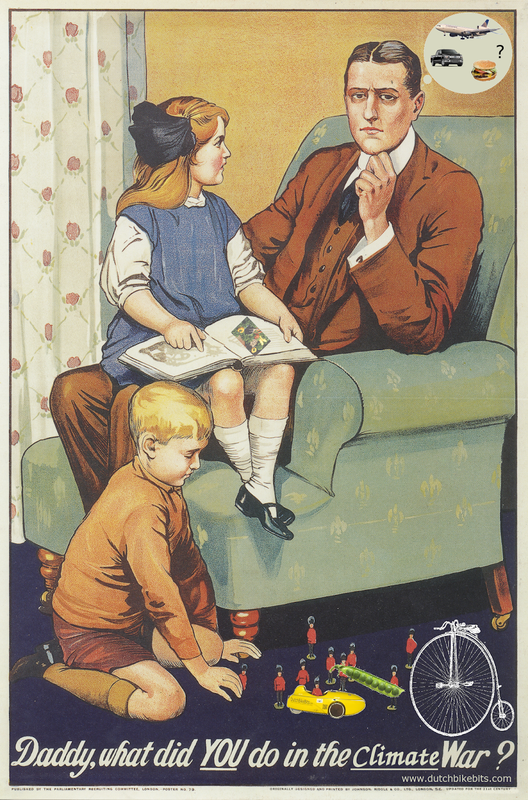 Home / Other News / A view from the cycle path: Daddy, what did you do in the climate war ? 100 years old and subtly updated for the war that we’re facing now. Do you remember the 8th of October 2018 ? That was the day when the world’s newspapers carried stories about the IPCC’s latest report on climate change. We were told that we faced catastrophe if we do not take serious action, starting right now, to tackle climate change within 12 years. We were informed about the most serious issue in the world right now which will affect everyone, or at least everyone’s children and grandchildren. Our generation will be held accountable for what we did or did not do. Do you also remember the 9th of October 2018 ? That’s the day when nothing out of the ordinary happened. Everyone carried on as usual, doing what they usually did, continuing to cause the problem that they’d been warned about one day before. It’s been much the same every day since. Perhaps our grandchildren aren’t important after all ? Last week we learnt that rather than emissions dropping, as they must, they have actually continued to rise. Why ? Because we’re burning more coal, oil and gas than ever and driving more cars than ever. While we like to think of ourselves as “green”, we’re actually making the problems worse and doing so at an ever increasing rate. Climate change is not being tackled and we have very little time left to reverse the course that we’re on.